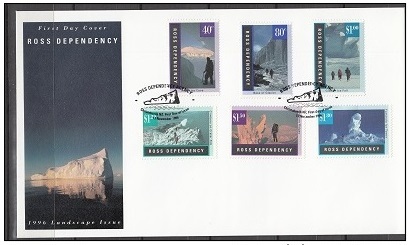 Virtual New Zealand Stamps: 1996 Ross Dependency Antarctic Landscapes. 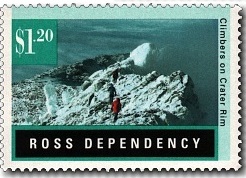 The Ross Dependency issued it second annual stamp issue on the 13th November 1996. 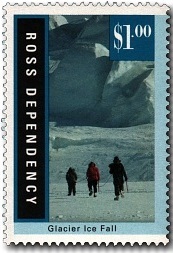 In this case, the theme was Antarctic Landscapes, a popular theme that has appeared often in the Ross Dependency stamp issue series. New Zealand's claimed territory in the Antarctic, the Ross Dependency, is justly famous for the variety and beauty of its wilderness landscape. From the ice-choked shores of the Ross Sea to the buckled pressure ridges on the fringe of the massive Ross Ice Shelf the Ross Dependency's landscape changes dramatically towards the interior of the 'seventh continent'. The Transantarctic Mountains, with peaks rising to over 4000 metres and all extensively glaciated, dissect Ross Dependency separating the coastal region from the high ice plateau of the East Antarctic Ice Shelf. 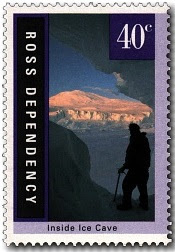 Active volcanoes, like Mount Erebus, are also important features of the Ross Dependency. 40c - Inside Ice Cave. The glaciers that flow off Ross Island and extend into the sea of McMurdo Sound are honeycombed by crevasses and ice caves. While crevasses are usually dangerous for unsuspecting and poorly equipped travellers, ice caves can be safe to enter and extremely beautiful. Rising 3754 metres above sea level Mount Erebus is the majestic centre piece of Ross Island, seen here framed by an ice cave in the Erebus Glacier near Cape Evans. 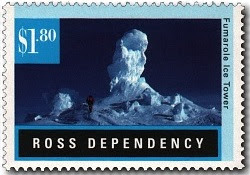 Ross Dependency has two main active volcanoes, Mount Erebus and Mount Melbourne and many more dormant ones, some of which lie within 300 kilometres of the Geographic South Pole. 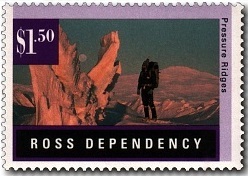 The Ross Dependency's Transantarctic Mountains are studded with high ice-clad peaks up to 4000 metres above sea level and interlaced with an extensive network of glaciers. In South Victoria Land the Transantarctic Range is noted for a most unusual feature known as Dry Valleys. Almost moonscape in appearance, the Dry Valleys is a rocky, snow-free valley system desiccated by dry wind and low temperatures. The valleys are capped by sandstone and dolerite peaks with steep-sided and extremely slow moving glaciers flowing between them. It is possible to walk safely underneath the ice wall of this glacier in the Beacon Valley as it moves only a few centimetres per year with little danger of sudden collapse or avalanche. $1.00 - Glacier Ice Fall. The Antarctic continent, about the size of the combined areas of the United States of America and Australia, is covered by 14 million square kilometres of ice. Antarctic ice varies in thickness from annual sea ice at one or two metres, to ice up to five kilometres deep on the plateau-like ice sheets of the interior. A build up of ice creates pressure and under gravity ice will flow as glaciers. Whenever glaciers go around corners or slide over the subsurface rock they will buckle and crack, forming crevasses and ice falls. Icefalls can be dangerous for a party on foot to negotiate as ice blocks may topple over. This party is roped together in case they cross a concealed crevasse that has had its opening drifted over by a weak layer of snow. $1.20 - Climbers on Crater Rim. The crater rim of the active volcanic vent of Mount Erebus is several kilometres in circumference. Scientists and climbers on the rim must be careful when picking their way among the ice towers and crumbly rock encrusted with snow and sulphur. Mount Erebus can erupt quite violently so there is also a danger on the rim of being hit by flying volcanic bombs. The greatest concern to researchers working near the summit of an Antarctic volcano is dealing with very low temperatures and ensuring tents are secure against strong winds. Mount Erebus is the most famous volcano in Ross Dependency rising to 3794 metres above McMurdo Sound. It was first climbed by members of Shackleton's 1907-09 British Antarctic Expedition. Jagged spires of hard sea-ice tower skyward near the coast of Ross Island. These pressure ridges are particularly pronounced where the sea ice of McMurdo Sound butts against the advancing Ross Ice Shelf close to New Zealand's Scott Base. During the spring month of October, Weddell seals give birth to their pups among the pressure ridges. Later in the summer these pressure ridges and the McMurdo Sound sea ice may be blown out into the Ross Sea during a southerly blizzard leaving open water in front of Scott Base. $1.80 - Fumerole Ice Tower. The flanks of Ross Dependency's famous volcano Mount Erebus are lined with chimney-like towers of ice up to 15 metres high. Hot volcanic gases escaping from vents condense and freeze in the sub-zero temperatures gradually growing to form a hollow tower. These towers gradually become unstable and topple over and the process starts anew. It is possible to cut open the base of one of these fumerole towers and have a sauna in the cavernous chamber inside. The volcanoes of Ross Dependency are home to unique species of thermophilic algae that can thrive in the volcanically heated soils around the crater rim. 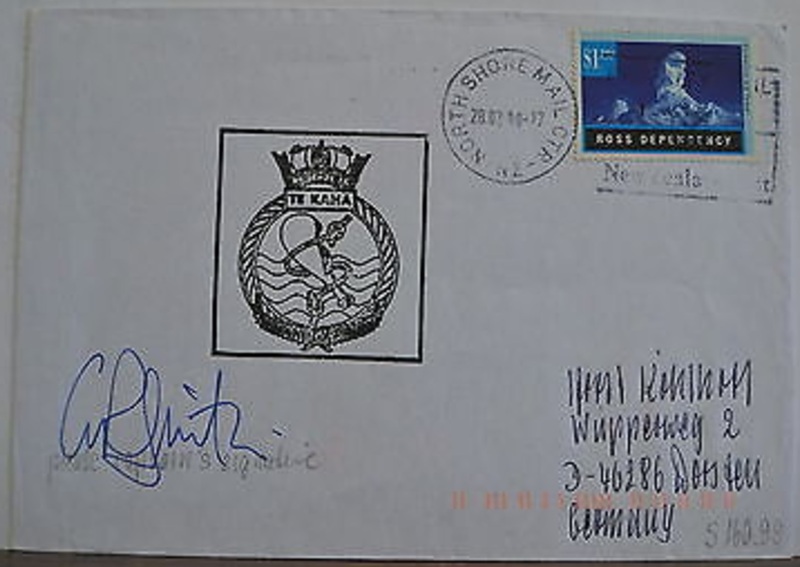 1997 cover NZ Frigate Te Kaha. Notice the frigate's cancel. 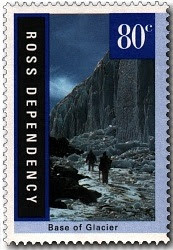 The postage stamp is a 1996 Ross Dependency $1.80 - Fumerole Ice Tower. (See above.) What is of interest is that this stamp was cancelled at the North Shore Mail Centre when Ross Dependency stamps are not supposed to be valid in New Zealand.